Keep your radio within arms reach at all times with the help of the Universal Radio Holder from Tru-Spec. Reliable communication with team members and other officers is essential to the success of any mission, and the carrier from Tru-Spec makes sure this is possible. Featuring a universal design, the case accommodates virtually all standard issued radios. Two elastic retention cords stretch overtop of the radio's body, locking it into place while still providing users with quick access when needed. The case's exterior is constructed from military-grade nylon and offers the weather and abrasion resistance needed to perform under even the worst conditions. Reinforced seams and interior walls add to the carrier's already impressive durability, ensuring that it will last for years. How is this adjustable? Does it stretch to fit the thickness of the radio? The cord will stretch to fit different size radios to secure it. 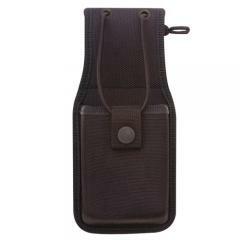 It is a universal radio holder with a measurement of 8.33" x 4" and will hold most standard police radios.